Daily Slideshow: With a bit of help from studded tires, the Lexus IS300 transforms from a capable road vehicle to an off-road beast worthy of an award-winning performance. 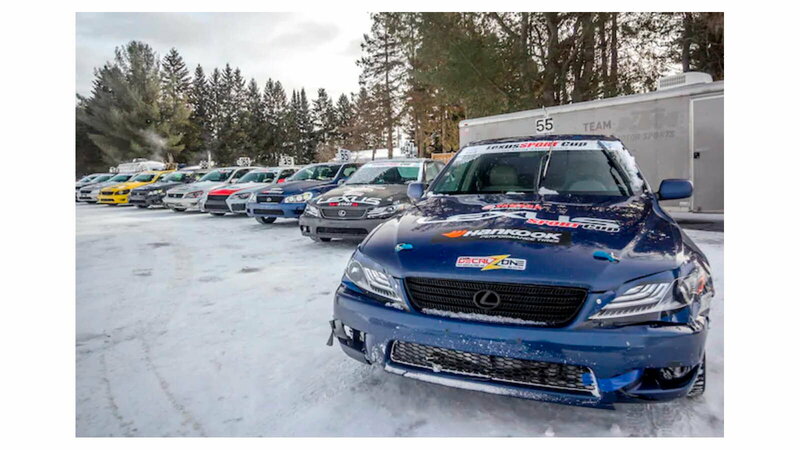 When you first hear about ice racing, Lexus probably isn't the first auto manufacturer that comes to mind. 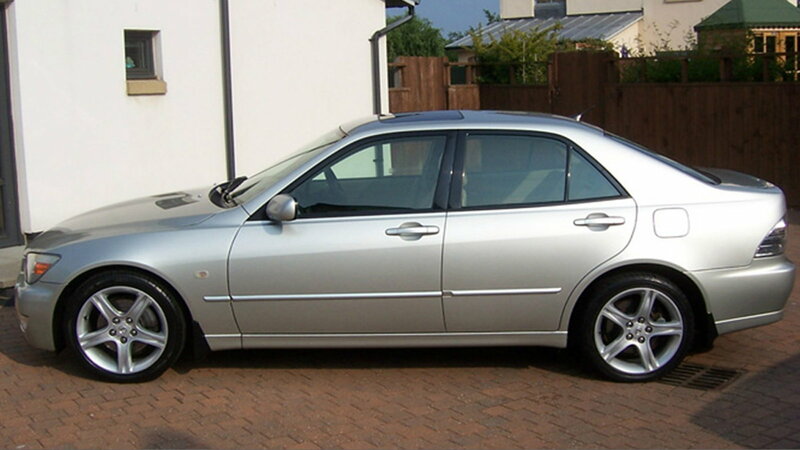 However, given the proper performance features and enhancements, there's no reason why a Lexus can't perform admirably on such a slippery surface. 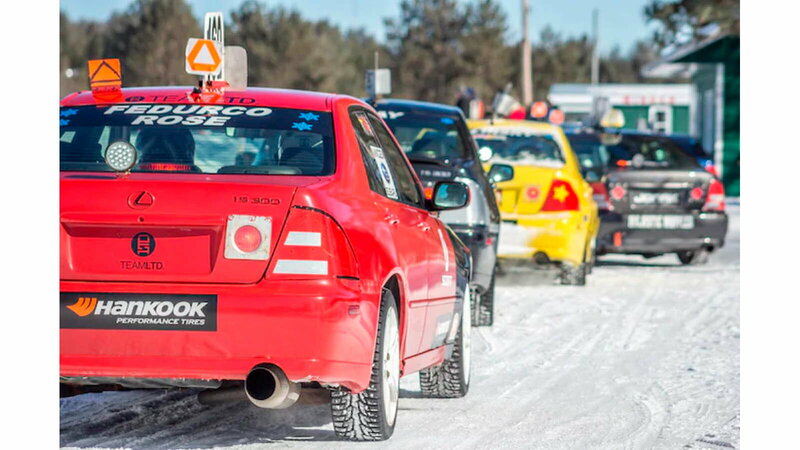 One Automobile Mag writer, Benjamin Hunting, takes to the track for a day of ice racing to see what it's all about. What is the LexusSPORT Cup? 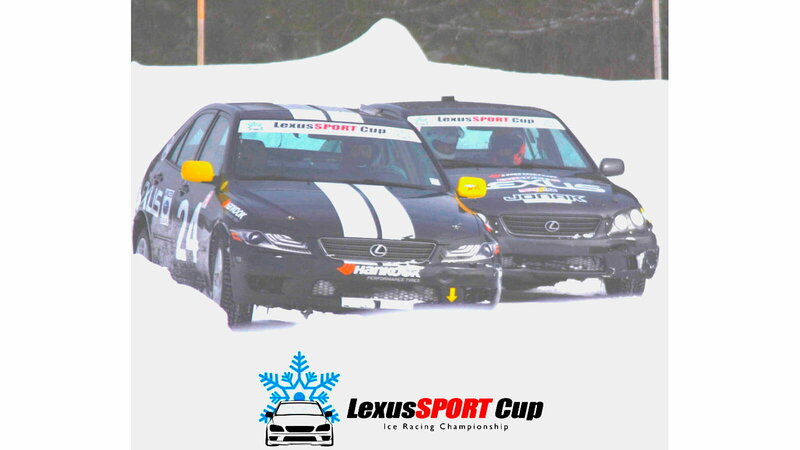 The inaugural LexusSPORT Cup, held in Minden, Ontario, Canada is produced by the Russ Bond Agency. Drivers are invited to rent out a car. 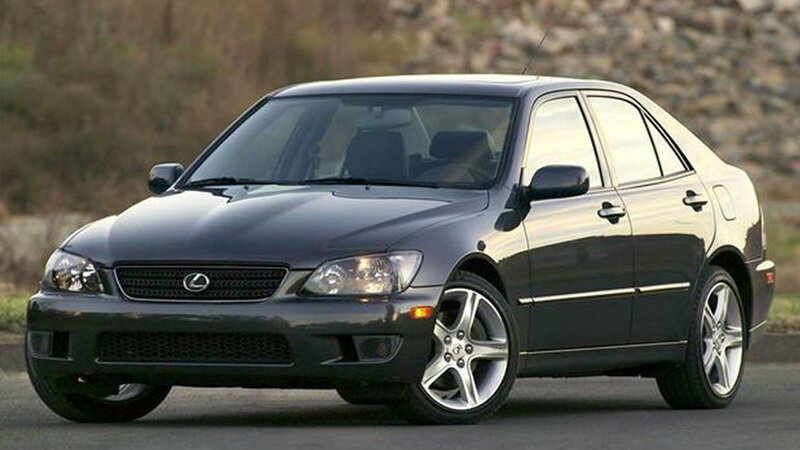 The competition is designed exclusively for the Lexus IS300. For those who choose to participate for more than a day, races take place on six consecutive Sundays. The no-contact series is made all the more challenging by the fact that every race is held on treacherous icy terrain. 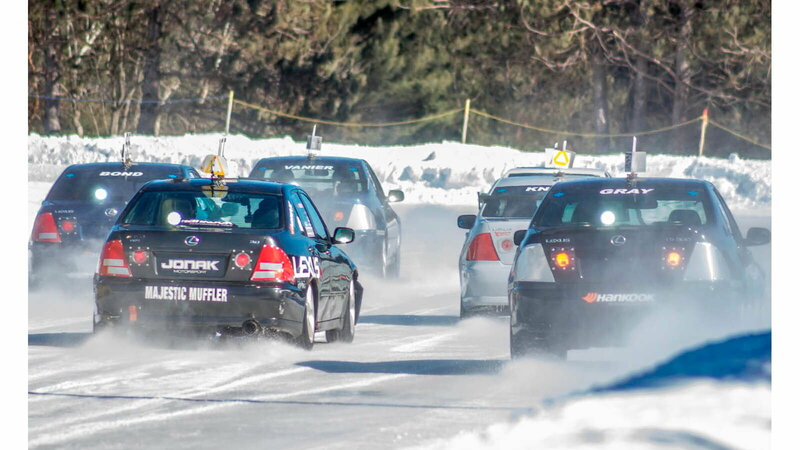 Join the conversation about ice racing in the IS 300 right here in ClubLexus.com. 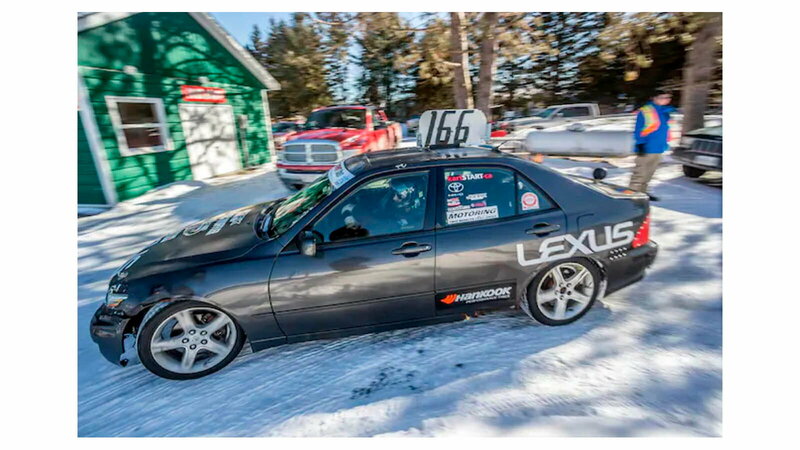 On its own, the Lexus IS300 isn't fully equipped for the task of ice racing. Some newer models are available with all-wheel-drive, but require a bit of extra assistance to make them ice track-worthy. With a lineage that consists of a track-tuned chassis, direct-shift transmission, and multiple performance driving modes, it doesn't take much to boost the IS300 to the next level of performance. Ice racing isn't the same as track racing, for many reasons. One of the most obvious reasons is the fact that the slippery surface naturally limits the speeds at which racers can safely travel. Accidents are a frequent occurrence, which is why race speeds are restricted to just 35 miles per hour. Hunting brought along his father, an experienced time trialist, for a joy ride as a passenger. 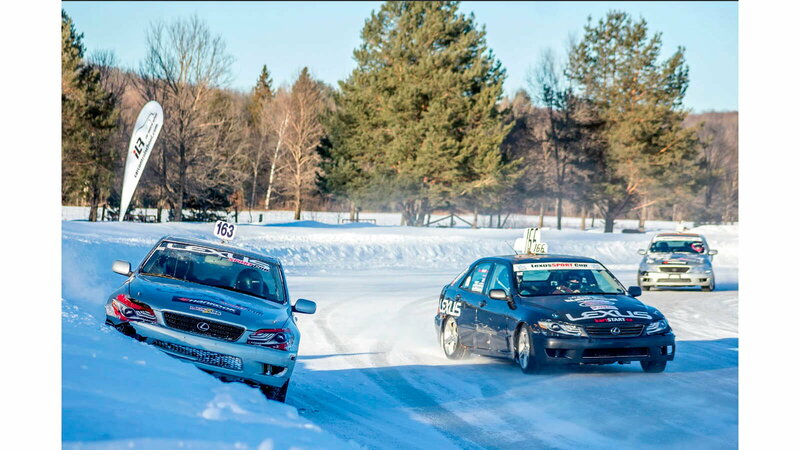 The slower speeds of ice racing make it more passenger-friendly than traditional track racing, even allowing passengers to act as a second pair of eyes to avoid any looming obstacles or hazards. Ice racing can also be dangerous, for obvious reasons. Although drivers operate their vehicles at slower speeds, and most cars are equipped with studded tires, not to mention all-wheel-drive, accidents are relatively common. Before the race started, Bond said, "Make sure that the traction control is set to 'off', and that the transmission is set to snow mode." 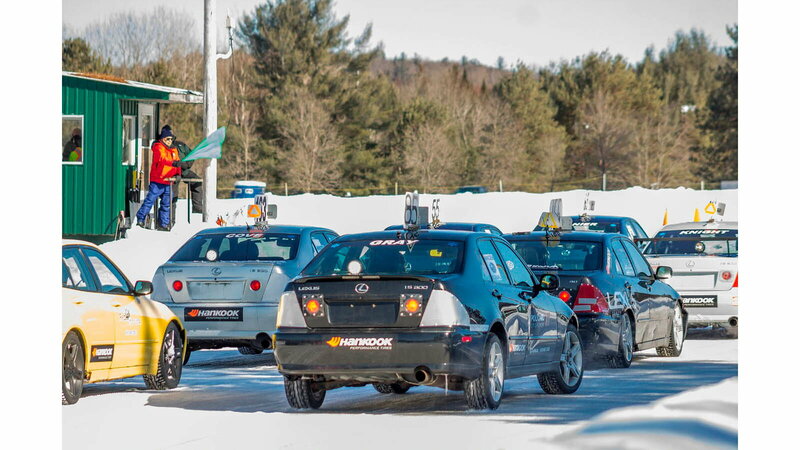 The spiked Hankook IpikeRS tires added much-needed traction to the ice track-bound Lexus. Studded tires are serious business. 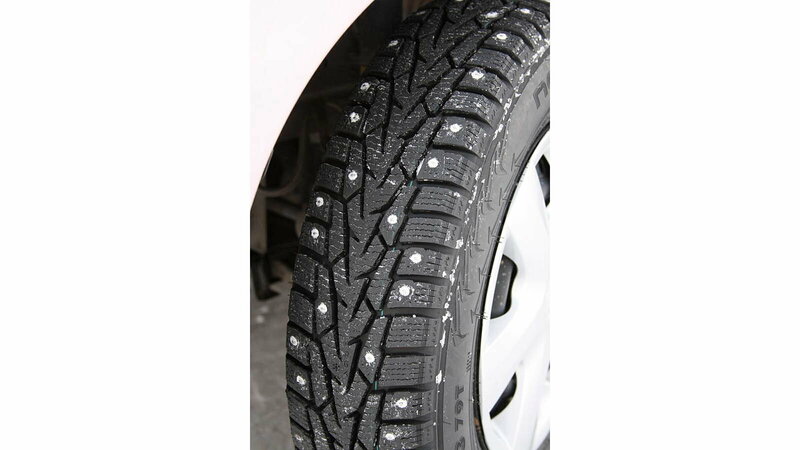 Metal studs are embedded inside the tread, providing the necessary grip and traction for an outing such as ice racing. In fact, these tires are so effective that they can potentially damage roads. Some states have outlawed studded tires completely, or strictly limit them to winter use only. This particular Lexus was outfitted with a 215-horsepower engine, which was plenty to power it around the track one lap after the next. In comparison, the latest base IS 300 (rear-wheel-drive) has an output of 241 horsepower at 5800 RPMs, while the all-wheel-drive IS 300 has an output of 260 horsepower at 6600 RPMs. Despite being an experienced race car driver, the start of the challenge didn't go as smoothly as Hunting and his father hoped. "As I line up on the grid for the first race, sixth out of nine cars, I...flub the start when the green flag drops with my camera still in my hand trying to get a shot of the grid," Hunting admits. Things didn't improve much in the second round, when "an unseen ice-hump under the snow launches the left side of the car skyward and causes my father to very vocally question his decision to ride shotgun." The third session is "a write-off," as "...I overdrive the studs enough to loop the car three times and elicit a helpful 'whatever you’re doing, it’s not working' analysis from the man responsible for half my genetic code." Feeling a bit more courageous during the fourth round, Hunting starts to feel more comfortable with the ice challenge. "I engage in some cat-and-mouse, bumper-on-bumper antics with a few of my fellow Lexuses," he explains, while avoiding a car that's slid onto a snowbank going around the fastest corner on the track. However, more drama unfolds during the final lap, when a car spins out and "sends me and a fellow competitor into tail-wagging fishtails that would have been disastrous on a road course but which were drama-free on the ice," thanks to the limited speeds. "There’s little more humbling to an experienced asphalt driver than ice racing, where track conditions can change from lap to lap," Hunting concludes at the end of a long day of racing. He continues, "...although my mid-pack performance won’t see me signing any autographs for the surprisingly large crowd any time soon," the car is intact, "and there’s a smile on my father’s face as he tells me that he regretted not renting his own IS as soon as we turned our second lap."